Trust in dental providers begins at a young age, which is why our team, along with professional organizations such the American Academy of Pediatrics and the American Dental Association, suggest that families establish a “dental home” by a child’s first birthday. How Does Our “Dental Home” Benefit Your Child? By starting your young child with regular visits to one of our children’s dentists in Rancho Cucamonga, you provide an opportunity for our pediatric providers to build a strong, trusting relationship with children as they age. The relationship encompasses all aspects of their oral health care in a comprehensive, accessible, and family-centered atmosphere. As with many aspects of a child’s growth, development, and related health care, your child’s oral care should be overseen by a dentist with the experience and training needed to properly meet the unique needs of children’s oral health. Having a pediatric specialist – also known as a pedodontist – is vital to ensure your child receives the specialized care required for developing teeth and jawbone structure. Take Advantage of Our New Patient Special for Your Child! California Dental Care & Orthodontics offers a School Saver Special! New school-age patients receive an oral exam, necessary x-rays, a cleaning, and consultation for only $35. Call 909.945.0024 or click here to request an appointment today. 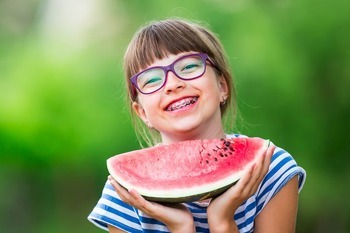 California Dental Care & Orthodontics is also pleased to offer several FREE consultations for children and teens, with special discounted pricing for committing to treatment on the same day. If you are interested in Invisalign or accelerated braces, take advantage of our complimentary Orthodontic Consultation. In addition, if you suspect your child may be suffering from sleep apnea, you can learn more about this common sleep disorder by scheduling our Sleep Apnea Examination – also free! Our initial appointment for new patients also includes a special Bonus Gift. Call 909.945.0024 to speak with a friendly team member – we look forward to welcoming you and your child to the California Dental Care & Orthodontics family! As one of the premier dental and orthodontic practices in Rancho Cucamonga, CA, our children’s dentists at California Dental Care & Orthodontics also provide comprehensive oral health care for pediatric patients from Rancho Cucamonga, Alta Loma, Ontario, Claremont, Fontana & Rialto, CA.